I sincerely hope these tips help you. If we don’t know what happens next, then our brain will stall by writing slowly so that it can figure out what happens next. I am not talking about extensive planning, I am talking about knowing what happens next. And not just a vague, “they hold a meeting to decide on how to take over the world”. That will not work all the time. What I do, before writing a scene, is that I take a few minutes to scribble down what happens next. I don’t go into extensive detailing, but it usually is 3-7 lines long. This is just for you, so be as messy as you want. Most of the time I can’t understand my chicken scratch-like handwriting when I look back, but writing it down helps me visualize it better. Example: This is from an unfinished novel of mine, the premise of which was something like X-men crossed with the show Leverage. Kiara, the main character is a thief who has been recruited into a secret unit in the Army for gifted humans. Unknown to them, she has been forced to spy on them. This is somewhere in the first half of the book where everybody’s personality has already been established and at this point it’s mainly focused on the plot and their interaction. However, you can see that their personality will also slightly bleed through the action. Make the scenes you write multi-purpose ones, so that they show the character’s personality slowly being revealed while the plot moves forward. Even if you don’t do it in the first draft, do it in the second or third one. It’s a sad truth that most people don’t respect writing as a profession and think it’s very easy. It’s not easy to write your novel when you are being constantly called to do this or that or to socialize. I am someone who finds it hard to get back into what I was doing once I am interrupted. So what I did was create a sacred space. And this is usually my work room which is the least frequented room in my house. I don’t have a set routine, but before going to write I usually let my family know and warn them that unless someone is dying – do not disturb. This is usually followed by a murderous glare because I know despite what I say, I will still be disturbed. I then put my phone on silent, turn off the Wi-Fi and start with writing a few lines on what the scene is about. The point of this is to have a routine; a place or specific time you sit to work at. If you repeat it a few times, your brain will automatically start to go into that work mode. Due to my job, I am not able to have a consistent time and most of the time not even a consistent place. So, what I do is make something into a routine so that my brain knows it’s time to write. You are training your brain to recognize a pattern. For me, this pattern is usually making coffee and cleaning up my immediate surroundings so that when I sit down to write, the clutter on the table doesn’t distract me. And when, and if, you end up with a writing block, change up the surroundings or routine a bit and see if that helps. I love procrastinating and sometimes I love to procrastinate on procrastination and those are my most productive times. This is why I love using a timer so much. In the Pomodoro technique it’s usually 20-25 minutes per session. I don’t tend to follow this but instead set my timer according to my mood that day. 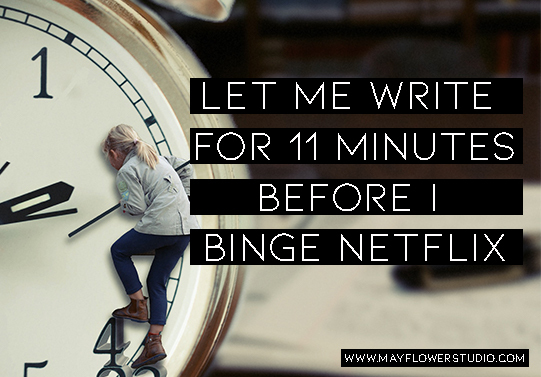 If I’m in a very, I-don’t-want-to-write-I-just-want-to-bingewatch-that-new-series-on-Netflix, then I set the timer to maybe 10-11 minutes and sit down and start typing. Seeing time tick down just makes me write really fast and I turn my inner editor off, because I don’t have time to listen to my brain pick at how bad my writing is when I just have eleven minutes to write. Most of the time, I continue writing even after the timer goes off, but some days, I stop. I don’t feel bad for stopping because I still finished my task of writing till the timer goes off and on some days that’s the best you can do. You can make setting the timer a regular thing before writing; make it part of the routine. Normally I set it for 23 minutes, because I love random numbers, on bad days I set it to 11 minutes and on the days I am just dying to write I don’t set it all. I can honestly promise that it’s one of the best ways to increase your writing speed. This is not something I personally use(I have used another version of this technique) because I tend to mumble a lot when I am thinking out ideas, but many of my clients swear by it. Most of them use Dragon but there are many others also available. Choose something that has good reviews and fits your budget. I can’t recommend any specific ones because I have never used them properly. Best part about this is that you speak faster than you write so you can just let the ideas flow and let the software capture while your inner editor will automatically shut off too. I have tried another version of this; my friend and I were co-authoring a book, and there was a scene that I had plotted. I was narrating it out loud and my friend was writing it down by pen. We hadn’t realised it, but we finished the first draft so fast. This leads me to the next point and it’s a tip my dad gave me. I can type pretty fast but I can write even faster. It could be because of the fact that you are typing everything that your speed is slow. So, why not give the good old pen and paper a try? Unless you have spent most of your life typing more than writing, chances are you are really faster with a pen than a keyboard. The fastest novel I have completed was an Y.A Dystopian called the Young Queen. I wrote 50k words in 9 days and it was entirely handwritten. I never do my second drafts on paper though, because by that time I have a solid idea of what the hell is happening in my story, and I take my time in rewriting. Nope, not talking about sprinting across the field. Writers often band together and conduct word sprints. In which they basically start writing at the same time and then try to write as much as possible in one go. It’s fun because you are not writing alone but no one is distracting you either. A website I would recommend is mywriteclub.com. It’s pretty amazing. You can see the live word count of your peers(but not read what they have written) and you get stars for completing each set of 100 and 1000 words. I mean, who can say no to getting stars for your writing? If you don’t want to join any club, ask in your social media if anyone is up for a word sprint. It makes writing more fun and you will end up writing more than what you write normally. I sincerely hope these methods help you. Have a nice day.